With house price growth in the city said to be at around 34% over the past 3 years and with the local market booming, it could be the ideal time to consider house or apartment investments in Manchester. 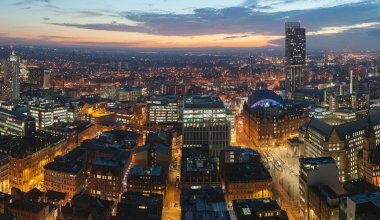 Property has always been a favourite investment asset, but you need to be sure of the market conditions in the area you’re looking at – and at the moment, one of the strongest locations in the UK is Manchester. We previously looked at how London is falling out of favour with overseas investors, as they flock to our Northern city, and the housing market here is showing no signs of slowing. Quite the opposite in fact. Across the city at the time of writing, there is somewhere in the region of 7,000 new properties being developed in Manchester – and over twice that figure if you count Salford and Salford Quays. Investors are buoyed by the economic stability of the city, as many factors coincide to make it the ideal location for new developments. Obviously as a thriving and busy city, with space limited within the centre, many developers are choosing apartment blocks over houses – and as managing these developments is our speciality, we thought we’d offer some advice to anyone looking to take the step into the market of apartment investments in Manchester. Firstly, buying to live and buying to let are two very different scenarios, and therefore considerations vary between these situations – so if it’s purely a purchase for investment purposes, make sure your head is definitely ruling your heart! Remember that you won’t be living there, so you don’t have to love every detail. Instead, think about the finance, facts and figures. Leave the brand new blocks to someone else – a brand new development is going to cost big bucks, so bide your time if you’ve got your eyes on one of the latest schemes. Re-sales almost always offer better value, with lower prices per square foot than the shiny newcomers. Check the condition carefully – always do your homework! Not all apartment blocks are maintained to the same high standard that we offer, and a poorly maintained block could leave you inheriting headaches that you could do without. Make sure it’s been well managed and looked after, so you’re not going to start uncovering problems once the contract has been exchanged. Find out who manages it – in relation to the above, as well as doing your homework on the property and area, it really is a massive benefit to find out who does all the communal maintenance and check their reviews. Consider that these elements will have a big impact on first impressions for potential tenants, and you don’t want tatty decor, poorly lit areas and overgrown landscaping putting them off. Add value with simple solutions – if the block is a little older, you can always add some small but sophisticated touches to help improve the rental value. Some simple interior decoration, changing kitchen cupboard handles and light fittings and adding a new bathroom cabinet, mirror and fittings can go a long way to adding extra appeal. Location location location – who do you want to rent to? Families, professionals or students? This will have a big impact on the location you buy in. Choose apartment blocks near the university for students, near Media City or the city centre for professionals. Talk to local agents and get to know the area and the local market. Appreciation – buying in the right place at the right time will give you a much better chance of your property appreciating over time and you need to consider longer-term investments if you want to reduce risk and get the best profitability from rental and sale later down the line. Get your finances in shape – make sure you know exactly what you can afford, get your mortgage (if you’re having one) information sorted in advance, look into and understand your tax liabilities and responsibilities.